Q1. Anne has €3, her mother pays her €4 for tidying the bedroom. Her dad says he will double everything she saves. If she saves her total money how. 3 Q1. Anne has €3, her mother pays her €4 for tidying the bedroom. Her dad says he will double everything she saves. If she saves her total money how much will Anne have? Q2. Cammie went to town one day and had €18. He spent €4 on lunch and then bought two games with the rest of it. How much did each game cost? 4 Q3. Sheelagh has sets of marbles which are stored in boxes which have three rows of 5 marbles. She decides to make a square using the contents of one box of marbles to make the side of the Square. What will be the area of the square? ? Q4. John needed to multiply -3 by -3 he writes down the answer, why is he wrong? Q5. Audrey is trying to find the prime factors of 75, but her calculator isn’t allowing her to. Why not? 5 Q6. Whenever Annie switches on her calculator she can’t get it to work. 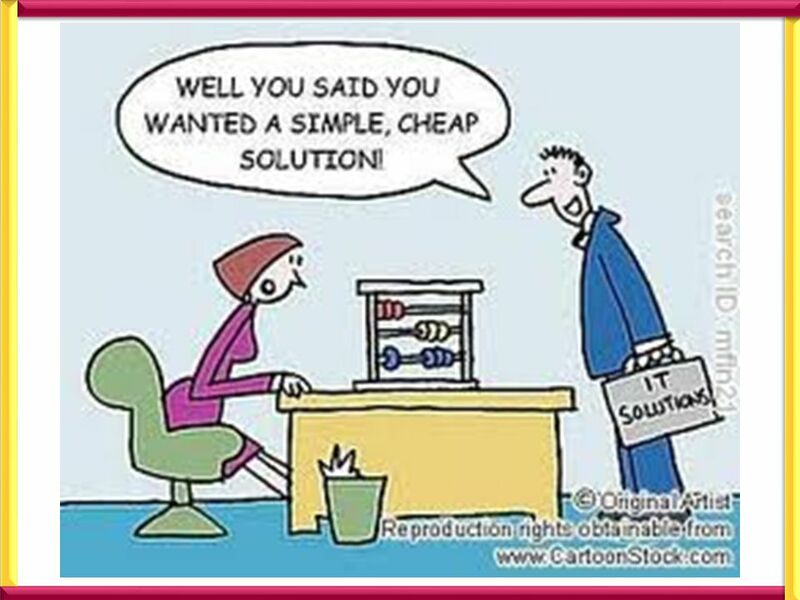 How can she get it back so she can do her sums? 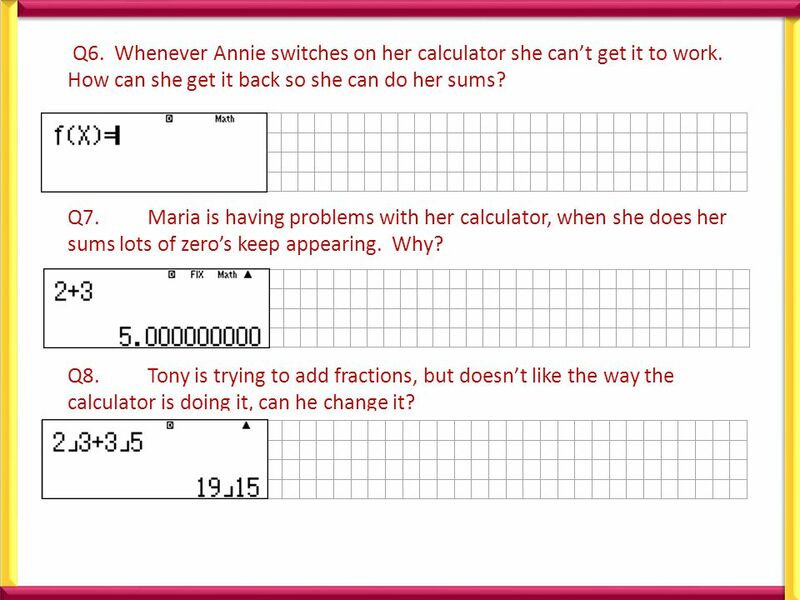 Q7.Maria is having problems with her calculator, when she does her sums lots of zero’s keep appearing. Why? 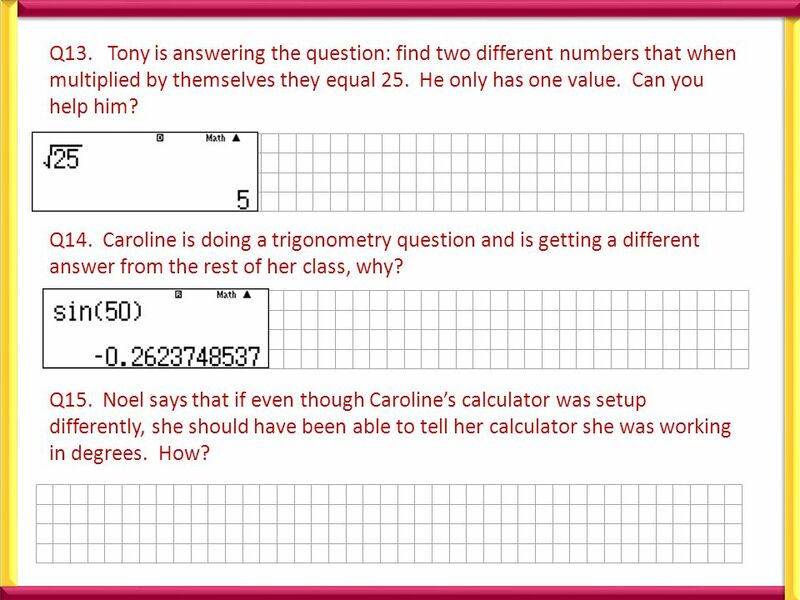 Q8.Tony is trying to add fractions, but doesn’t like the way the calculator is doing it, can he change it? 7 Q11. 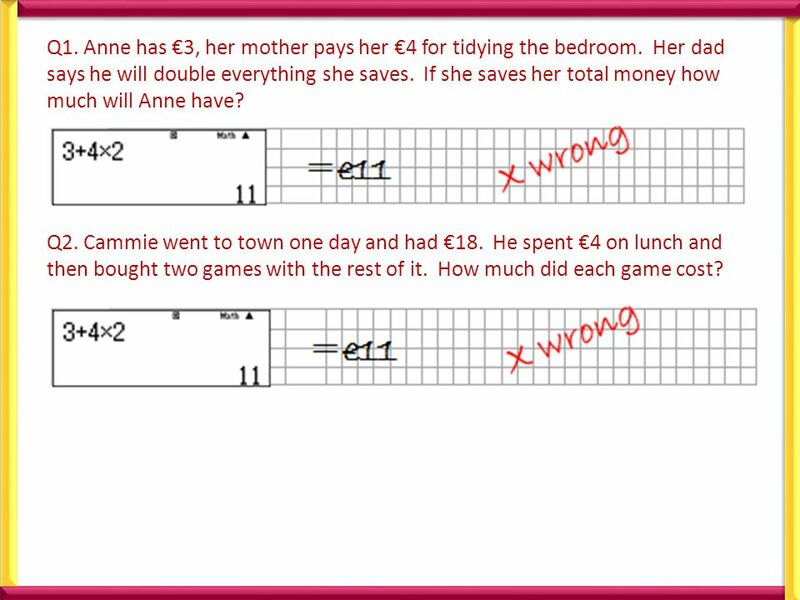 Fiona did the question below using the ANS key, why did she get it wrong? Amanda: Brenda: Ciara: Danielle have pictures of JLS in the ratio 5:2:4:1 (Danielle has sense, she doesn’t like them very much) they have 492 posters in total. How many do they each have? Q12. Siona said it would have been easier to store the 41 into the memory, how could she do that? 8 Q13. Tony is answering the question: find two different numbers that when multiplied by themselves they equal 25. He only has one value. Can you help him? Q14. Caroline is doing a trigonometry question and is getting a different answer from the rest of her class, why? Q15. 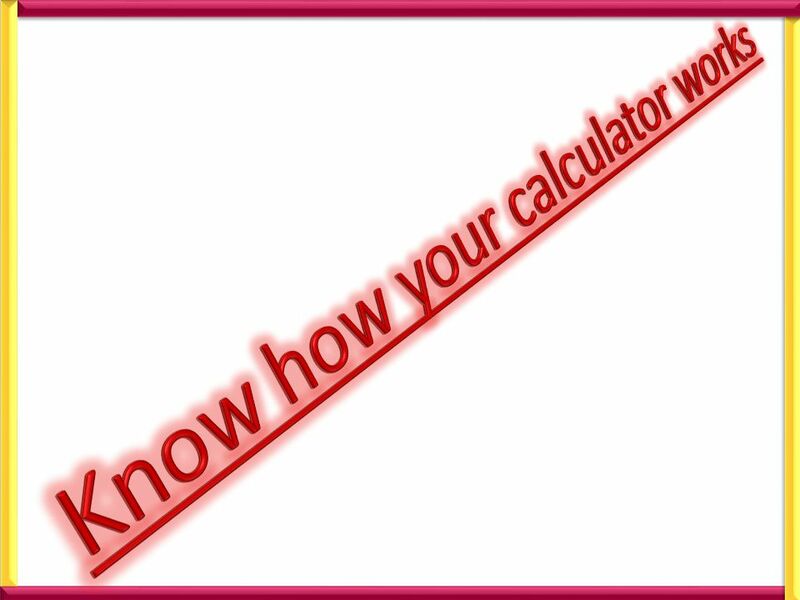 Noel says that if even though Caroline’s calculator was setup differently, she should have been able to tell her calculator she was working in degrees. How? 9 Q16. Gary’s big brother stole his calculator, now he can barely see the screen when he uses it. What did his brother do and how does he change it back? Q17. 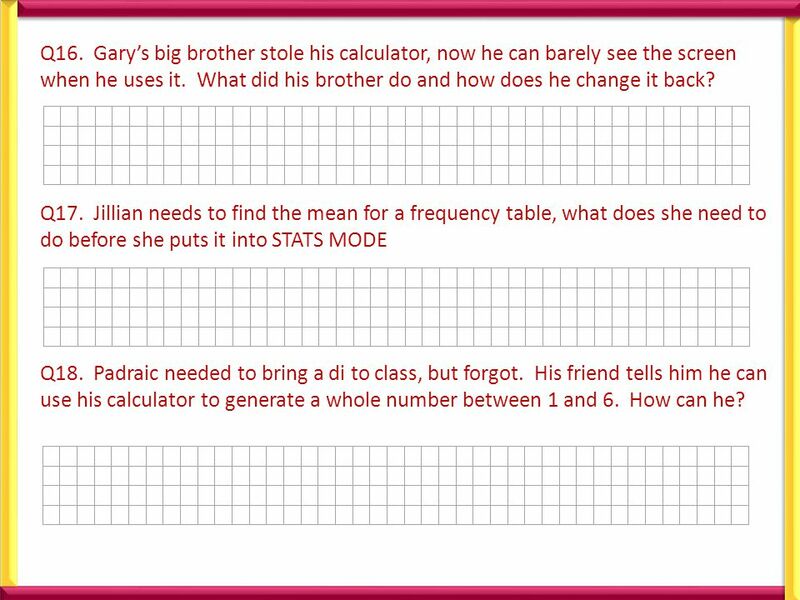 Jillian needs to find the mean for a frequency table, what does she need to do before she puts it into STATS MODE Q18. Padraic needed to bring a di to class, but forgot. His friend tells him he can use his calculator to generate a whole number between 1 and 6. How can he? Download ppt "Q1. Anne has €3, her mother pays her €4 for tidying the bedroom. Her dad says he will double everything she saves. If she saves her total money how." F451 Discussions for Section II The Sieve and the Sand. 1 C Programming. 2 Operators 3 Operators in C An operator is a symbol that tells the computer to perform certain mathematical or logical manipulation. MA10209 – Week 2 Tutorial B3/B4, Andrew Kennedy. 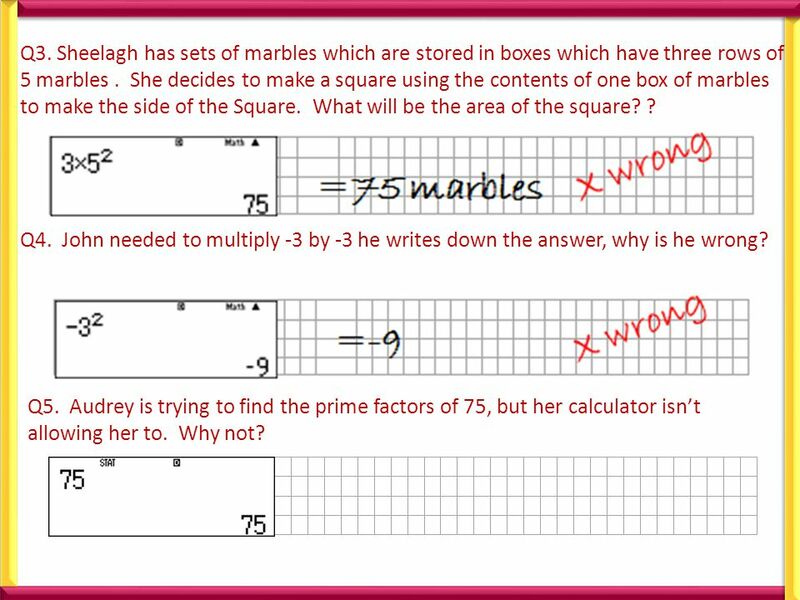 Top Tips (response to sheet 1) Make sure you answer the question - requires a yes/no as well as an explanation. MA10209 – Week 8 Tutorial B3/B4, Andrew Kennedy. people.bath.ac.uk/aik22/ma10209 Top Tips (response to sheet 7) Be careful with calculations, this is. IBRAHIM (AS) & HAJJ - 1 The following set of questions can be used for a team competition or as a group assessment by the teacher. The teacher can play. ICANN MEETING NO. 38 | JUNE 2010 ALSes Survey Analysis Prelimenary results ALSes Survey June 2010. Surveying the THRIVE Community One Year Later Results from Online Survey. Unit Test Practice Number Sense Part I START. Why Dont You Ask Your Teacher? Diane Price, ACU Community Languages ConferenceJuly Why Dont You Ask Your Teacher? How good do you know Hungary?. QUESTIONS  Q1:Have you ever been to Hungary?  Q2:Which of the following countries is/are neightborn/s to Hungary?  Q3:Which. Design of Questionnaire for teachers FocusNo. of Qs (A) General Feedback 3Q12 Q8 Q13 (B) Teaching & Learning Style 2Q11 Q10 (C) Language Development 4141. Quiz on weight and mass This quiz has 10 multiple choice questions Click on the answer box you think is correct BEWARE ! One mistake and you have to start. Produced by the Department of Learning and Teaching Resources, Belfast Institute. Want to be a xxxxx? Welcome to College Name Click here to start. Greater Washington Board of Trade Sustainability Survey Released April 21, 2010.